The Symphony has all of your favorite Baby Lock features combined in one masterpiece of a machine, allowing you to perfectly blend time-treasured techniques with modern day conveniences. The Advanced Pivoting Feature and 1⁄4″ foot give you so much accuracy in your patterns, you’ll sing its praises. And with 460 stitches to choose from, 17 feet, and a speed of 1,000 spm, you can hit all the right notes. 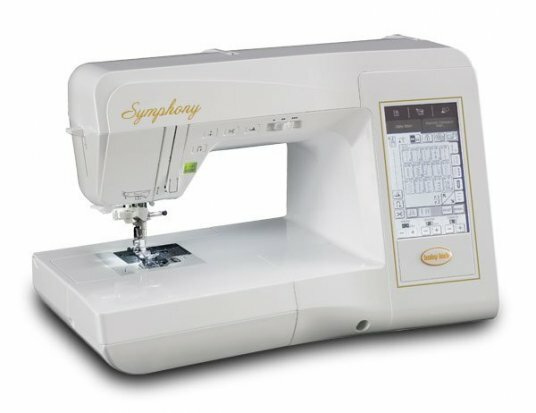 With so many amazing features coming together in one machine, the Symphony lets you quilt with a full range of creativity. The Symphony’s easy-to-read touch screen makes it simple to access your machine’s stitches and settings. The top loading bobbin case lets you focus on your sewing. It’s jam-proof because the top-loading bobbin keeps the thread right where you need it.